Q&A with Germaine Caprio, Key Buyer. 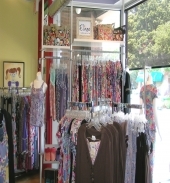 Germaine Caprio: Majamas Boutique started as a fit-testing location and a kind of outlet for our wholesale division. It has turned into a full blown boutique offering not only Majamas and Nixilu maternity clothing but also a full range of maternity bras, mastectomy garments and our new lounge collection for ALL women made under the Eliseo label. We have rounded out the assortment by offering baby lines like Tea, Zutano, Deu Par Deu and more. We give expert bra fittings and assist new mothers with everything from clothing to how to calm their babies. In addition we help women after they’ve gone through breast surgery by providing them with the right garments so they can be as comfortable as possible and look like a million bucks. Germaine: Customers come to us because we offer expert bra fittings and beautiful, unique clothing in a warm, casual atmosphere. We do our best to make everyone thrilled before they leave giving them personal and friendly service they can’t find anywhere else. Germaine: First, we support vendors who manufacture in the United States, like us. We also look for vendors who offer safe and sustainable products that are made with the smallest impact on the environment. Fashionable, well made products are important to us and we do our best to offer the lines that aren’t seen in the large, discount stores. Of course we sell our brands, Majamas, Nixilu and Eliseo but we also love Juliet Dream Maternity and Fancee Free Bras. Germaine: We are seeing a trend in this economy to garments that are versatile, so women can wear them pregnant and then for nursing after delivery but we hooked into that trend 12 years ago with our own brands. We definitely see more mastectomy needs and women in this category are seeking fashionable sleep wear like our Majamas pjs because they hold a breast form well. They also love our Original Nursing Tank because that has pockets to hold their forms. This category had been aching for attractive clothes and we feel we’ve tapped into that with not only our Majamas tanks but also our Eliseo lounge line. Germaine: We mainly sell sizes Small thru Large for women and 0-12 months for baby. Our women’s fashion starts at $39 for skirts and we go up to $120 for maternity denim and some dresses. Best baby price point is between $30 and $40. We sell a lot of bras that range from our Easy Bra at $27 to Anita bras that go up to $85 per bra. Germaine: Our average customer is a size Medium. Germaine: Roughly $120 per visit. Germaine: Our customer base is pregnant women or new nursing moms. Moms looking for baby clothing and accessories or anyone seeking a new mom gift or a baby gift. Women post-surgical shop with us for comfortable and cute clothes that work for their new bodies. Germaine: We are truly wholesalers so the retail end of our business has been a live and learn experience. We are always figuring out better ways to bring in clients and we look to offer unique items that can’t be found in large department or discount stores. We pride ourselves on our personal service and we make every customer feel important. We are environmentally sound and package every sale in one of our cloth boutique bags that are made with our left over production fabric. Some women come back just to get a different bag! This makes them feel important and special and it’s just one more way to put that special twist on our store.